John Procai's record sturgeon catch. The largest sturgeon ever brought in with a rod and reel on Wisconsin waters was a 170.5 pound sturgeon caught on Yellow Lake by John J. Procai on September 22, 1979. The approximately 100 year old sturgeon was 79 inches in length with a 39 inch girth. Mr. Procai released the fish after it was registered. "Some people tell fish stories, but few ever really substantiate them. John J. Procai, Danbury, has perhaps the biggest fish story in Wisconsin and photos to prove it. Procai spent 50 minutes bringing in a 170.5 lb. sturgeon on Saturday, Sept. 22. The fish measured in at 79 inches in length and 39 inch girth. As it stands now, it is the largest sturgeon ever brought in with a rod and reel on Wisconsin waters. The fish was caught in Big Yellow Lake. A few weeks earlier, a friend of Procai's caught a similiar fish. Pete Petersen, Danbury, caught a sturgeon which was one inch longer but weighted less than Procai's fish. At that time Petersen thought he had the record sturgeon. It will take a few weeks for the DNR to verify the record sturgeon but other fishermen still have a chance to catch the record. After the DNR registered and tagged it, Procai showed he was a true sportsman and threw the sturgeon back into Yellow Lake." 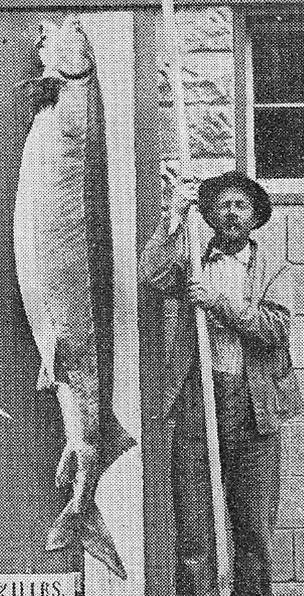 In 1912, Glen Marsh brought in a 7 foot 4 inch rock sturgeon weighing 211 pounds from Lake McKenzie in Ferron Park (Scott Township). 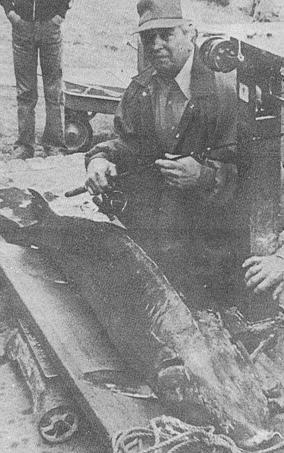 Thank you to May Schultz, History Library, Burnett County Historical Society, for the newspaper articles and information about the Lake McKenzie rock sturgeon.